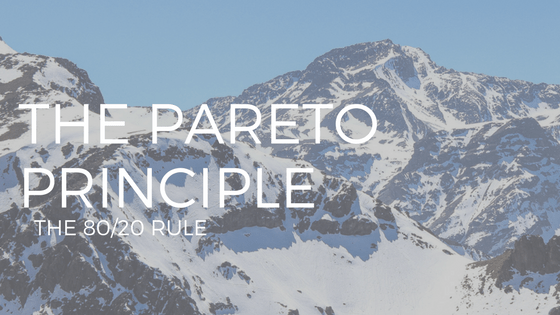 “No matter what I do, I can’t seem to shake the Pareto Principle.” This comment was hurled at me by a client upset that regardless of her hiring and training practices, the sales teams she manages for her company all seem to thrive on the 80/20 rule. The Pareto Principle dictates that 80% of results come from 20% of efforts. She was pouring through the most recent quarter’s analysis of sales results in her territory and her frustration levels rose the further he delved into the report. She is the Western Canada sales manager for a large multinational company, and has built her career by steadily outperforming her peers on her way up the corporate ladder. She adjusted her monitor so that I too could see what she was looking at and pointed to the reasons for her indignation. Her sales regions are divided into 18 geographic territories each of which has a sales team dedicated to reaching agreed-upon sales targets and as she pointed to a series of graphs on her screen, the reasons for her annoyance became apparent to me. Each team ranged in size from 5 to 12 sales people and the results for each team had been broken down to reflect the performance of individual members. Almost without exception, the graphs vividly showed that approximately 80% of each team’s collective performance was the result of the efforts of 20% of its members. The results also showed that while most of the teams were meeting or exceeding their allotted sales quotas, many team members were not achieving theirs, meaning that those top 20% performers, by exceeding their quotas, were enabling non-performers to be part of a successful squad. But what was causing her the most frustration was that the 80/20 rule did not apply to rewards. In her company, sales people are all compensated with the same salaries. Each salesperson has an opportunity to earn an annual bonus that is based on the percentage by which they exceed their quotas. But those who do not meet the quotas still receive the same salaries as those who do. And no matter how hard she tries, and no matter how many changes she makes to the teams, the Pareto Rule never seems to disappear. Her concern is not an isolated one. I have yet to work with any company where senior managers do not express similar frustration. I also serve on several boards and experience firsthand these same results. My question: where do you fit? Are you a member of the larger group, the 80% who collectively contribute 20% of the value or are you a proud, high-functioning member of that minority group which delivers 80% of the results? Whichever group you find yourself in is the one in which you have chosen to place yourself. And if you have placed yourself in the larger group that delivers the lesser result, you have agreed to accept a lesser award. Great success always finds its way to the very few who do so very much. Exactly the way it should be. The Pareto Principle is based on cause-and-effect: it states that for many events, roughly 80% of the effects come from 20% of the causes. In the workplace, leaders often inadvertently punish their top performers when they place all of their time and attention on developing employees who consistently underperform. The message, albeit not intention, is often higher performers are left to their own devices with little or guidance, feedback and encouragement. Over time, these top contributors become discouraged, and wonder why with all the focused effort and results they produce, are they frequently overlooked and seemingly taken advantage of. If you are a leader, ask yourself who you spend most of your time and energy on? Be certain it is the employees who are most deserving of your attention, time and recognition. If you are an employee, it would be advantageous to reframe your habits and efforts through the Pareto Principle lens. You can only belong to one club: you are either in the 20% or the 80%. It’s your career, please choose wisely. ← The Habit of Self-Delusion: Do You Have It? Thanks Rael!. Great article. I’ve re-posted to the EAL Practitioners FB Group. This is a closed group for Equine Assisted Learning Facilitators and Coaches.